This early 70s bluesy deep track from the West Coast is taken at such a snail’s pace it’s more of a funeral dirge than anything else – and this feeling is enhanced by the moody horns and Beulah’s downward cadences. One for 3am listening I think. I could do without the wah wah guitar but fortunately it’s pretty far back in the mix here, unlike on the flip which is billed as “Part 2” but is in fact a completely different funk instrumental opus. 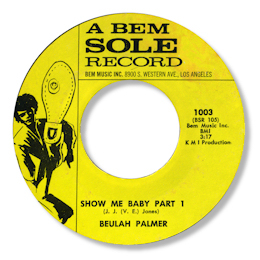 UPDATE ~ I have now managed to find a copy of Beulah's second BEM SOLE release and it is a double sided beauty. As its title suggests "My Man In Vietnam" is a cry of pain concerning what her man is going through on the battlefield, and a prayer that he may be spared. Nice funky little tune and arrangment. 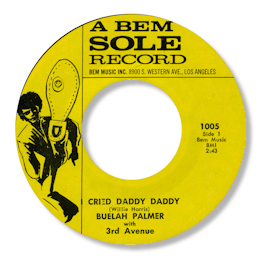 But "Cried Daddy Daddy" is an excellent deep soul piece, full of loneliness and despair as Beulah cries out in anguish at being on her own. A super West Coast bluesy arrangment and a lively tenor sax solo make a fine backdrop for Beulah's wailing. Lovely.